There is a lot of information on the internet - and much of it is free - but nothing beats being able to make a pot of tea, load up a plate with assorted biscuits and to sit in a comfortable armchair before a roaring, crackling fire (especially this winter!) with an honest to goodness magazine chock full of exotica and fascination. Very few magazines manage to maintain that delight cover to cover but Arawasi is one of them, and it stands out for its depth of coverage and colour. Unlike so much of the transient tidbits of fact and opinion on the internet it can be treasured as part of a library and constantly referred to, as I do. Arawasi Extra 1 is a compilation of the first home-produced Arawasi magazines into a glossy, colourful and revised concentration of articles and features. Even if you have the earlier magazines this special issue is not to be missed because it contains so much new and interesting information as well as being full of wonderful colour illustrations and rare photographs. The delight begins as soon as you open this special issue, with Takano Fumio's stunning Hayate artwork in beautiful colour. Then we are treated to an in-depth examination of Kawasaki's charismatic Ki-10 biplane fighter with photographs, colour profiles and interior schematics in colour. No modeller planning to build Fine Molds beauty should be without this. A fascinating feature on Kawasaki engines by the knowledgeable Mike Goodwin follows this up. Now quickly past the article on the 10th Independent Flying Squadron in the attack on Hong Kong without comment - a conflict of interest as the authorship there and here is shared! 'Heinkels Over Japan, Part 1' by Peter Starkings delivers much and promises more, with beautiful illustrations by Zygmunt Szeremeta. The full story of German aircraft exports to Japan is overdue and I look forward to Peter's continuation of this theme. Paul Thompson writes a piece on aikoku (patriotism) aircraft illustrated by photographs and charming period postcards in colour and this is followed by a feature on a quartet of unusual Hayabusa in particularly striking plumage, with colour profiles again illustrated by Zygmunt with photographs to enjoy as well, including those Burmese presentation aircraft. This is undoubtedly the most accurate rendering of the peacock tail insignia. There is little out there on Chinese aviation history, an interest of this blog, and even less on the puppet regimes that supported the Japanese, so the fascinating article on the Nanking National Air Force (NNAF) with superbly clear photographs and more beautiful profiles by Zygmunt is a treasure of great value. This is followed by a revealing article about the Last Emperor of China, Pu Yi, by George Eleftheriou. But even after this visual and intellectual feast (the biscuits have almost all gone) there is still more to come. The fascinating and humane exploration of a Kamikaze Group Photo by renowned author Henry Sakaida linking past to present, followed by an exhaustive examination of a much used Japanese airstrip complex at Wewak in New Guinea, the first part of a series by Richard Dunn with modern colour photographs by Justin Taylan. And finally, another colour feature on the making of a superb 1/25th scale Ki-10 model in wood by Tanaka Shôichi and an "on location" piece about the remains of a Ki-21 "Sally" bomber in Thailand. I cannot praise the achievement or impact of Arawasi too highly. 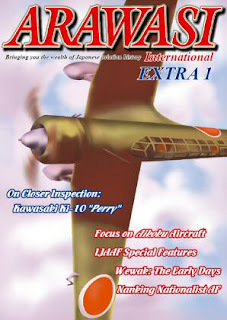 In the early days of interest in Japanese aviation the availability of such a magazine, in English, could only be dreamed of. The internet may have the sound and fury but it is the silently powerful treasure chests like Arawasi Extra 1 which will endure and ultimately provide the most sustainable and valuable record for those interested in and enthused by this subject. Very highly recommended and exceptionally good value. You don't have any good resource were to buy this magazine - I can't find any through my usual channels. Your best bet is to write directly to Arawasi - I'm sure they can arrange sale to you. Hopefully the Arawasi editor will read this and comment here about buying arrangements and whether there are any other outlets for the magazine. It would help if you could tell your local military bookshop about our magazine. The "History of Manchukuo Aviation" is coming out around this August. I've sent you a reply. Perhaps you didn't receive it. Lower your spam filter, perhaps? In fact, I didn't got your answer. Anyway, and since I am still (very!) interested in the forthcoming book about Manchukuo aviation, I will drop you a line asap (perhaps using an alternative e-mail).